Incredibly striking art deco style dining table shown here in maple with an ebony crossbanding and inlay. 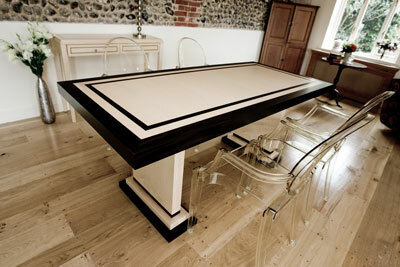 This table exudes the classic art deco style and would make a real statement in any dining room. We are also able to offer this style of table in any size that suits you - circular, oval or rectangular in any size! If you would like to change any aspect of this item or have other design ideas, please call or use our bespoke request form.